Miss Merry Christmas is a Baroque Works agent partnered with Mr. 4. She is a stout, middle-aged woman with red hair, and wears a necktie that resembles a Christmas tree, which goes with her codename. Other notable attire includes a large pair of purple-lensed sunglasses, a basket strapped to her back, and sandals. Unlike her partner, who is very slow, Miss Merry Christmas talks very fast, often only pronouncing the first syllable of the word in a high-pitched, child-like voice. 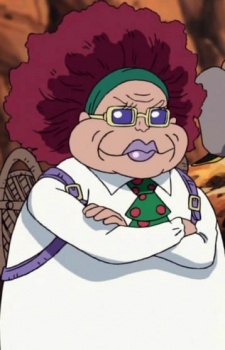 Miss Merry Christmas has the power of the Mogu Mogu no Mi (モグモグの実, Mole Mole Fruit, called the "Diggy Diggy Fruit" in the English versions), a Zoan type fruit that gives her the ability to transform into a giant mole or a mole-human hybrid, Usopp thinks is a penguin. Because of this transformation, she can easily dig underground in the sands of Arabasta and sneak up on opponents, and attack with her sharp digging claws.